In most applications, accuracy is one of the more critical specifications that a product needs to meet. However, accuracy is also one of the more, if not the most, confusing parameter for any product including MEMS pressure sensors. This application tip provides system designers with insight to deal with the numerous sources of confusion. Accuracy and precision are frequently used interchangeably, especially in promotional literature for sensor products. Two figures identify the obvious differences between the two specifications. 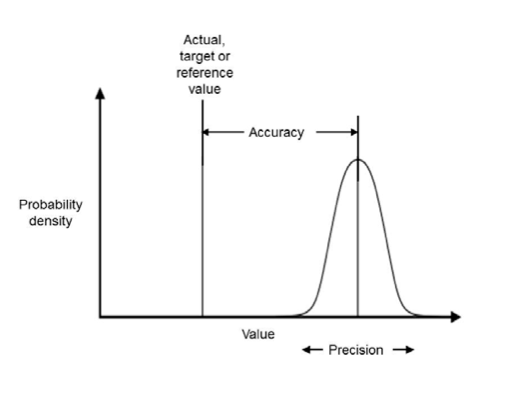 Figure 1 shows the statistical distribution for precision versus the proximity to an actual, target or reference value for accuracy. A more precise sensor has a narrower distribution and a more accurate sensor is closer to the actual value. 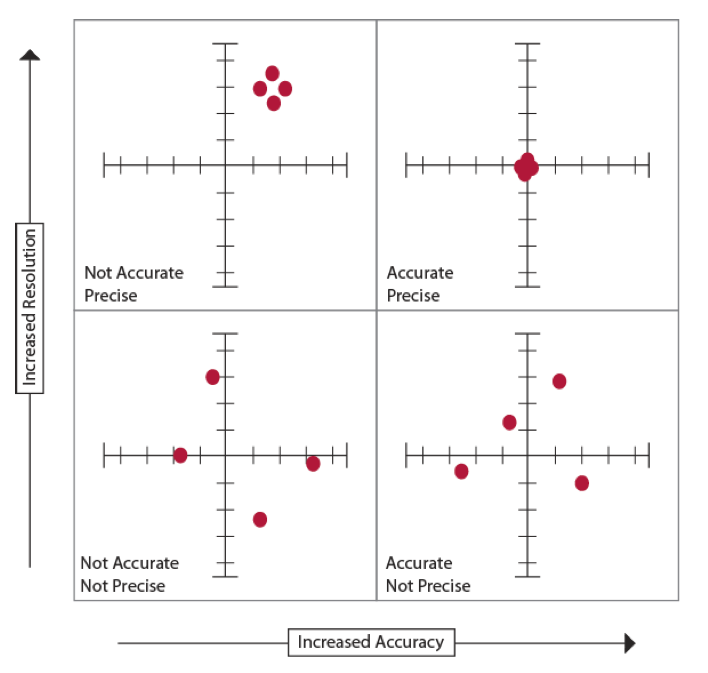 Alternatively, Figure 2 shows how precision and accuracy can increase or decrease independently. Figure 1. The relationship between accuracy and precision. Figure 2. A target provides an informative image of the difference between accuracy and precision. Precision and resolution are also frequently abused parameters. Unlike precision, resolution is the smallest measurement a sensor can reliably indicate, which is typically important in identifying input changes at low signal levels from noise in the application. An analog to digital converter (ADC) that quantizes the smooth output of an analog sensor for use in a digital control application has increased resolution as the number of bits increases. Figure 3 shows the difference between resolution and accuracy when the sensor's output is quantized. Figure 3. 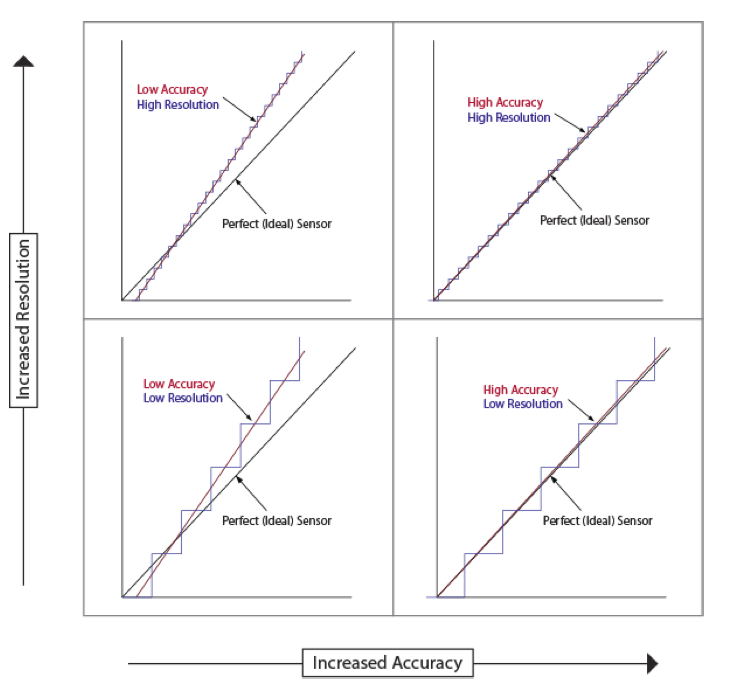 The visual difference between accuracy and resolution and an ideal sensor. High resolution and high accuracy occur in the upper right hand corner. When a company compares its own products with claims of twice the accuracy for one model or family over another, the comparison should be accurate. However, there are many accepted formats for measuring and specifying accuracy, so comparing the accuracy of one company's product verses another company's product is much more difficult. Some industries, such as automotive or aerospace specify how accuracy should be measured to simplify this process. Accuracy is usually specified in terms of inaccuracy or error. 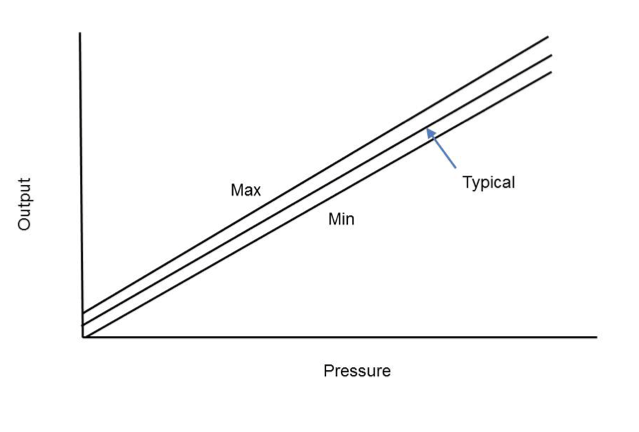 In general, sources of error include: zero error, span error, pressure-non-linearity, thermal effect on zero, thermal effect on span, thermal hysteresis, pressure hysteresis, and non-repeatability. Other system considerations that can affect accuracy include response time, ratiometricity, long term stability or stability over life, and more. The first step toward comparing any pressure sensor data is using the same output specification of mm of mercury (Hg), kilopascals (kPA), bar, inches of water, etc. Typically, most MEMS pressure sensor measurements are made at a fixed voltage and room temperature. The two primary approaches for specifying accuracy are total error band and error budget. Total Error Band (TEB) accuracy specifies the maximum deviation of the output values within limits defined by the sensor's underlying technology. 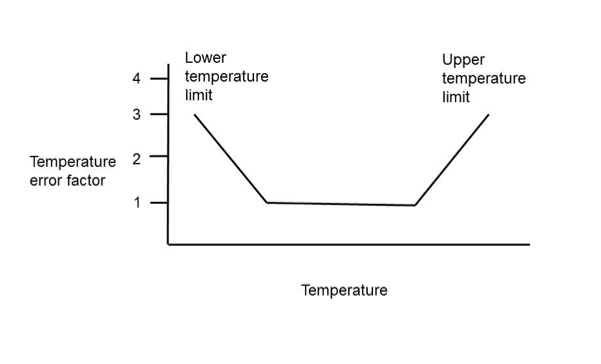 In some instances, an error band multiplier increases the allowed inaccuracy at extremes such as increasing the temperature error at low and high temperatures as shown in Figure 4. The error band may also increase at pressure or other upper or lower limits. Figure 4. The temperature error factor can increase the allowed sensor error by a value such as ±3 times at the temperature limits. Error Budget accuracy can consist of linearity, temperature and pressure hysteresis, the temperature coefficient of span, and the temperature coefficient of offset. Figure 5 shows a typical error budget plot. The transfer function can be provided with ±error values, and the limits may have a curved shape at upper or lower limits as well. Figure 5. The error budget provides max and min tolerances around a typical level. Other factors that influence accuracy are the characteristics shape of the curve of the sensing technology and operating point of the application. For example, an endpoint specification may not be appropriate for an application that normally operates in the mid-range of full scale. There several different approaches to specify sensor accuracy. Two common techniques have been discussed. The supplier's choice of an accuracy specification usually involves the technology used for the sensor, choice of test equipment, ease of testing (frequently to address cost objectives) and/or a targeted volume market segment such as industrial, automotive, medical, consumer, etc. The challenge for the user when comparing products from different suppliers is to fully research each supplier's methodology for specifying accuracy and then choose the approach and sensor that best meets the application requirements.